Vice President Mike Pence addressed concerned Asian nations today, assuring our allies and North Korea that if provoked, the US would respond with full force. 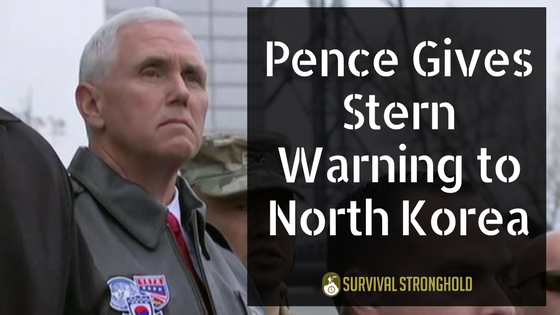 In a statement made while standing less than 100 feet away from North Korean soldiers in the Korean Demilitarized Zone, Pence told reporters that Pyongyang needed to understand that President Trump’s administration’s approach in dealing with North Korea would be different than that of previous administrations. This comes after several failed missile tests conducted by the security state in recent weeks, in response to the US’ expansion of a defensive missile system in South Korea. Following the recent air strike in Syria and detonation of the “Mother of All Bombs” on an ISIS encampment in Afghanistan, President Trump is clearly eager to flex his military might, and the Vice President’s statement reflected this, as he offered these two instances as examples to North Korea not to test the President’s resolve. We shared several weeks ago that in light of the expanded US missile system in South Korea, North Korea’s northern neighbor and the only country they cooperate with, China, was not pleased and warned of starting an arms race. However, in recent weeks, President Trump has had reportedly productive talks with the Chinese President, Xi Jinping. This warmed relationship has resulted in reassurance from President Trump that China is now willing to work with us to quell the threat or North Korea. As US warships set course for North Korea, however, they were being tailed by Chinese and Russian reconnaissance ships. Russia has warned the US to tread lightly when dealing with North Korea, and a spokesperson for the Kremlin said earlier this week that they are watching the situation with “grave concern”. We’ll continue to keep an eye on this story as it unfolds.